Things started off brightly for Hideo Nakata's latest offering 'Chatroom', which premiered in the Un Certain Regard competition at the 2010 Cannes film festival, alongside the likes of 'Blue Valentine' and eventual winner 'Ha Ha Ha'. Since then, things have not been so great. Having directed a string of acclaimed horror films (namely 'Ringu', 'Ringu 2', and 'Dark Water'), Nakata has been critically burned by the reception to 'Chatroom'. Which possibly explains the slightly odd release date covering the Christmas week. The criticism has been severe, and possibly a little on the harsh side. Not to say that much of the criticism is undeserved however. 'Chatroom' is like a Daily Mail fantasy come to life. But more on that later. The film charts the online and offline lives of a group of teenagers resulting from their congregations in an internet chatroom, portraying itself as a sort of 'Lord Of The Flies' for the 21st century. William (Aaron Johnson) sets up this chatroom as a means to his malevolent ends, preying on his victims in a misguided attempt to banish his own demons. It all gets a bit messy and the film climaxes with a chase sequence better suited to 'The Bill' than a feature film. It's not all bad though. Indeed, 'Chatroom' begins rather promisingly. 'Chatroom' delivers a fascinating visual representation of the online world, which contrasts the dreary reality to such an extent that I initially thought that there was something wrong with the projection. It genuinely looked like something filmed on a cameraphone. This technique actually works well within the context of the film, contrasting the vibrant saturation of the internet world. Plaudits must go to the set design team, who envisaged the virtual world as a hotel of sorts, with a seemingly infinite series of chatrooms emanating from each corridor. Whether intentionally or otherwise, they provided an evocative hint of the "prison" in 'Oldboy', appropriately capturing some of the helplessness that the teenagers feel under William's wrath. Another interesting aspect of 'Chatroom' is the continuation of Nakata's exploration of how young people interact with technology, which began with his use of video in the original version of 'The Ring' in the mid-nineties. Unfortunately, I'd argue that the zeitgeist of chatrooms has probably passed by now, and 'Catfish' is more of a relevant (and successful) capturing of how online manipulation works. And calling 'Chatroom' a period piece seems a little unwarranted. Worse still, screen writer Enda Walsh (who originally wrote this for the stage) has created a sensationalist work that suggests misinformed knowledge of the subject matter he handled. The internet is seen solely as a "big bad evil", a surefire way to some sort of psychological or physical damage in children. This is a weak message that feeds on the anxieties of similarly misinformed parents. The manner in which the group of teenagers is characterised is weak also, with stereotypes and stilted dialogue at the ready. 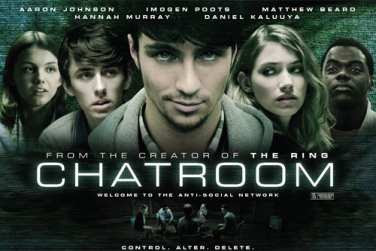 Besides the many weaker aspects, I actually ended up quite enjoying 'Chatroom'. The contrasting worlds provided a fascinating visual stimulus, matched by a couple of witty animated sequences. But what really helps is if you simply treat the film like a late night episode of 'Hollyoaks'. The film certainly treats you like a viewer of such a programme. 'Chatroom' is on limited release across the UK now.